A traditional social event to celebrate the life of Scottish poet Rabbie Burns has also ended up helping local people recovering from drug and alcohol addiction in the Chesterfield area. 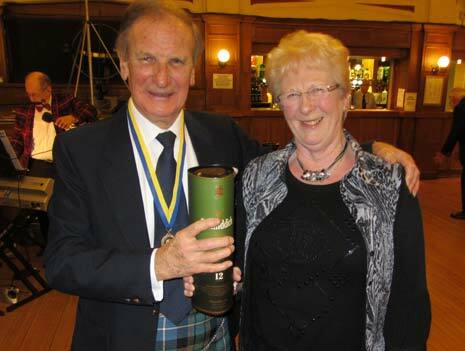 The Rotary Club of Chesterfield held its annual Burns Night Celebration at the Winding Wheel in Chesterfield on Monday 28th January 2013. A 'Roll-a-Coin' competition raised £120 for the recently launched local charity 'Hope Springs Recovery Centre', a support centre based at Springwell House, Newbold Road, that aims to provide crucial additional support for North Derbyshire people still on the road to recovery from drug and alcohol addiction. The competition for a bottle of whisky was won by Mrs Ruth Miller (below). After the haggis was piped in by Pipe Major Tom Varley, past president Jim Savage made the traditional 'Address to the Haggis' by reciting the famous Robert Burns poem. 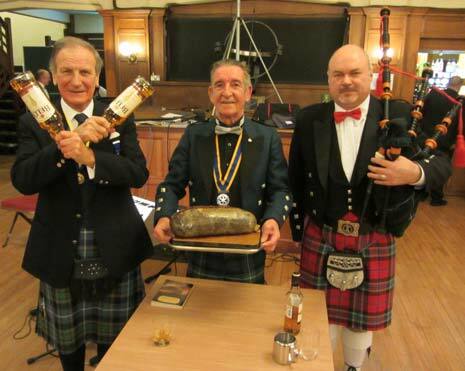 Haggis, accompanied by bashed neeps and champit tatties, was then served to the 100 members and guests in attendance. Music for dancing at the Burns Night event was provided by Brian Freeman on the keyboards. Main organiser was past president Jim Savage. If you are interested in joining the Chesterfield Rotary Club please contact Alan Clarke on 01246 811616.